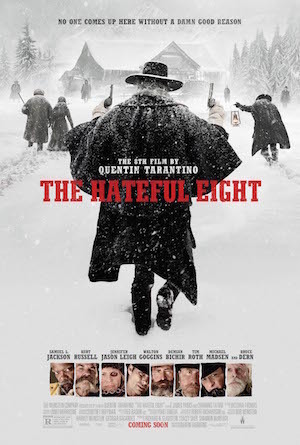 Something to Muse About: THE HATEFUL EIGHT | Watch Quentin Tarantino Appear on "Lip Sync Battle"! THE HATEFUL EIGHT | Watch Quentin Tarantino Appear on "Lip Sync Battle"! In the words of the host of "Lip Sync Battle" LL Cool J, "The Hateful Eight is hot baby!" Last week, Quentin Tarantino showed his support for Channing Tatum, a star in his film THE HATEFUL EIGHT, as an audience member at the Season 2 Premiere of the Spike TV show. Check out this clip of Quentin, Channing, Jenna Dewan-Tatum and LL Cool J! Watch Quentin Tarantino at the "Lip Sync Battle"
And in case you missed it, make sure to check out the NEW teaser for Channing Tatum's character in The Weinstein Company's new film. THE HATEFUL EIGHT is now playing nationwide!